This classic homemade apple pie has an incredible flavor with a buttery, crisp crust one can only dream about. Bring this epic homemade pie to your next holiday gathering and get ready for the fanfare it brings! The incredible aroma that this particular pie recipe has is amazing. The combination of honey, apples, cinnamon, vanilla and coconut sugar contribute to the perfect apple aroma. You’ll love the smell that comes wafting from the kitchen when this homemade apple pie is in the oven. HOLIDAY FAVORITE – Be sure to check out our recipe for English Trifle or Homemade Pecan Pie for the holiday season! Here’s what I have learned about making homemade apple pie. Good pie baking takes a lot of practice, but never let the idea of making a pie intimidate you. 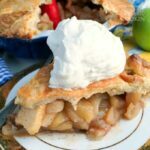 I have made this apple pie recipe and several other pie recipes, so many times that I have all the steps down. 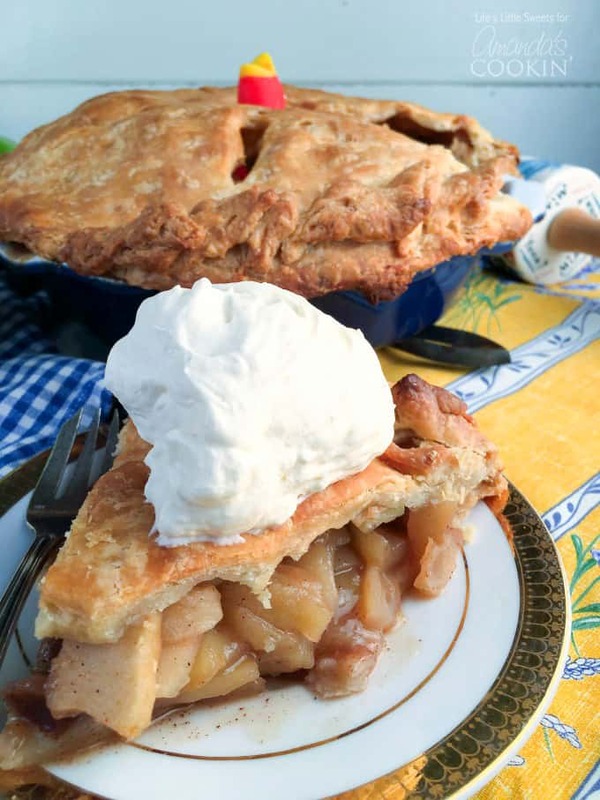 If this is the first time you are making a pie, read and re-read the directions, give yourself ample time and you can always split up the steps and do the apple pie filling and/or pie crust the day before. Why not enlist a friend or family member as a helper? Once the “parts” of the pie are assembled, it’s just a matter of baking it. 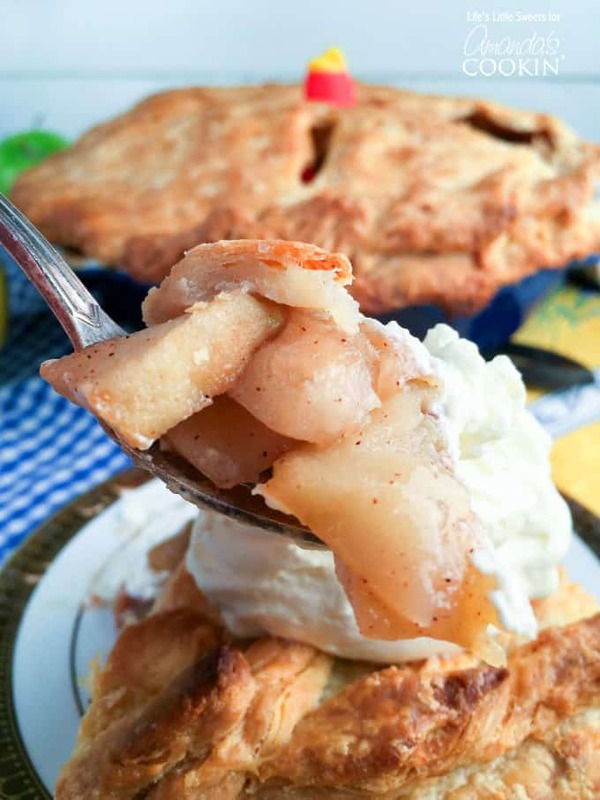 This apple pie recipe comes from several years of practice and refining. It’s inspired by my Mile High Pear Pie recipe. 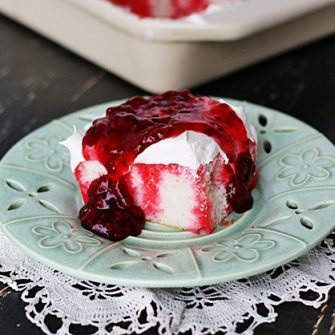 I suggest serving it with a scoop of vanilla ice cream and/or my recipe for Vanilla Whipped Cream. Cut butter into cubes and place in the freezer to chill before preparing dough, keeping the butter cold helps to make the crust flaky as it bakes! You can use a rolling pin specifically for pastry that is made out of ceramic or marble to help keep the crust cold, chill 5-10 minutes in the refrigerator before using. A pie bird vents the pie filling, helps to keep the pie filling from overflowing (although, I find that it doesn’t completely help with this) and can make the crust more crisp. Bake the pie on a baking sheet to prevent the pie filling from getting on the bottom of your oven, even if you use a pie bird, it’s a good idea just in case and it helps with handing the pie when taking it out of the oven. I recommend blind baking the bottom dough first using pie weights to keep the dough from bubbling up. This also helps keep the bottom crust from being wet and soggy. Make sure to allow the pie to cool completely before slicing to allow the pie filling to set. If the pie is sliced when it’s hot, all the juice will flow out of it. When you chill the water for making the dough, chill 3/4-1 cup water, I generally use almost 3/4 ice water. You will need as little as 1/4 cup but it will depend on the humidity of the air you are working in. You can keep the ice water on hand if the dough dries out between handling/chilling sessions. You want nice big, gorgeous butter lumps in the crust pastry; make sure not to overwork the dough, it should not be too sticky nor falling apart. For the top crust, for easy handling, lay parchment paper down over a large cutting board (or pastry mat), roll out dough into a large circle (about 1/4″ inch thick) and then cover with plastic wrap and chill for a 1/2 hour in the refrigerator before handling again. Remember to always chill the dough between handling it for about a 1/2 hour, this is more time consuming but so worth getting that perfect crust. You have options for the thickness of the crust. You can roll it out to 1/4″ inch thick and just enough to cover the pie with none or some left over for cut outs. 1/4″ inch thickness is my favorite thickness because it makes the crust more sturdy for slicing and nice to bite into. Alternately, if you want to do a lot of cutouts on top of the pie, you can roll it out to 1/8″ thick and save any trimmings for cut outs to decorate the top of the pie. I wrote the recipe to make the pie filling first and then work on the double crust but you can reverse the order. In fact, it might make sense to depending on if you are spreading out making this over a couple days. I personally just like to marinate those apples for a while so they absorb the flavor of all the ingredients. You can cover and refrigerate the pie filling if you want, but if I am also making the double crust right away, I just leave it covered on the counter while I work with the dough. I do recommend Granny Smith apples because they are not overly sweet and hold up very well to baking. You can save time by purchasing a pre-made, double crust, however homemade dough is so delicious it’s worth it the extra effort if you’re willing. The egg wash is optional with this recipe. 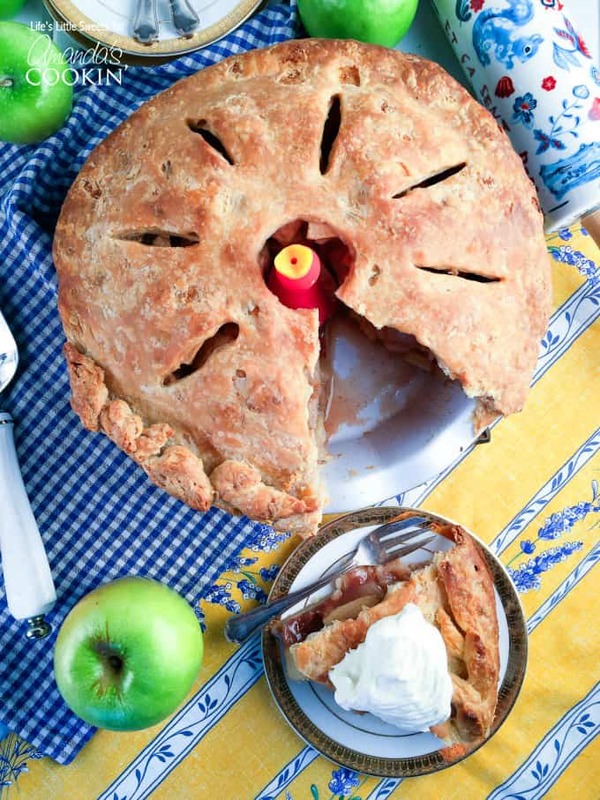 The photos show this homemade apple pie recipe without the egg wash. I went minimalist and opted not to have it because I felt this crust shines by itself. I hope you enjoy this homemade apple pie, it is our family favorite! Have you done a lot of apple picking this year? 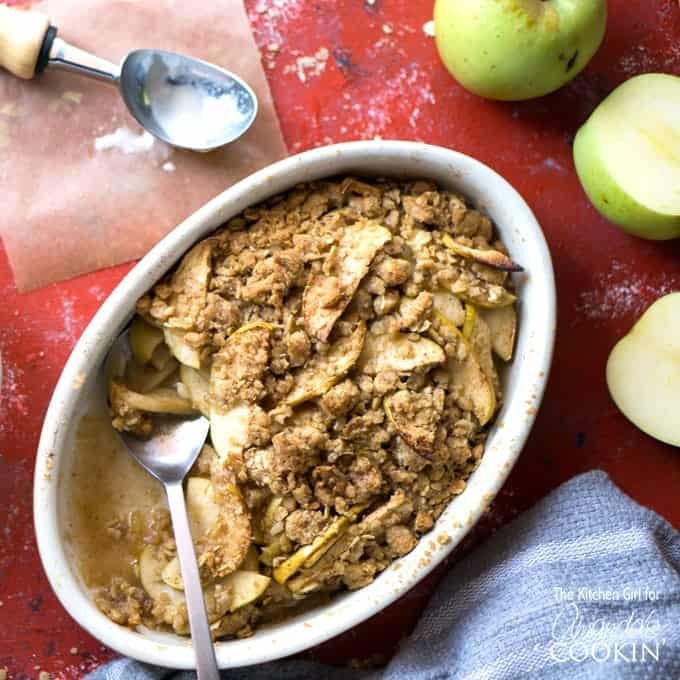 Use up your apples with this Baked Apple Crisp! This Baked Apple Crisp will be your new go-to crisp recipe that the whole family will love. Add a scoop of vanilla ice cream to top it all off! In a large bowl, combine all apple pie filling ingredients, cover and set aside to marinate. Refrigerate, if preparing the day before. When mixing ingredients, I recommend sprinkling the ingredients over the sliced apples, coating evenly and then mix thoroughly. Before starting, make sure all ingredients are cold to ensure the crust comes out flaky. *Please read through my suggestions in the notes section for more details and further explanation of specific steps. Grease a pie dish and set aside. After chilling for a 1/2 hour, divide dough ball evenly in half with a dough scraper. Wrap 1 half in the plastic wrap and return to the refrigerator to chill while you work what will be the bottom crust. Roll out the dough half into 1/4-inch thick circle to fit into the greased pie dish, leaving a slight overhang to account for any shrinkage when baking (1/2-inch overhang). Cover with a square of parchment paper, fill in pie weights and return to the refrigerator for 1/2 hour. While you wait for the bottom crust to chill, take out the half that will be the top crust. Cover a large cutting board with parchment paper and lightly flour the surface. Roll out a 1/4-inch thick circle for the top over a lightly floured surface. If any dough is sticky, just use some flour, to ease handling at any step of the way. Cover the dough circle completely with the plastic wrap to prevent it from drying out. Chill for a half hour. When all pie filling ingredients have been prepared and the top dough is chilling for the last time, then preheat oven to 425 degrees F.
Pricking the bottom crust is not necessary if you have pie weights, if you don't have pie weights, then you must prick the bottom crust. Make sure the bottom crust is covered with parchment paper (aluminum foil can also be used), pour the pie weights over the parchment paper and bake for 12-15 minutes until the bottom crust is light golden brown. 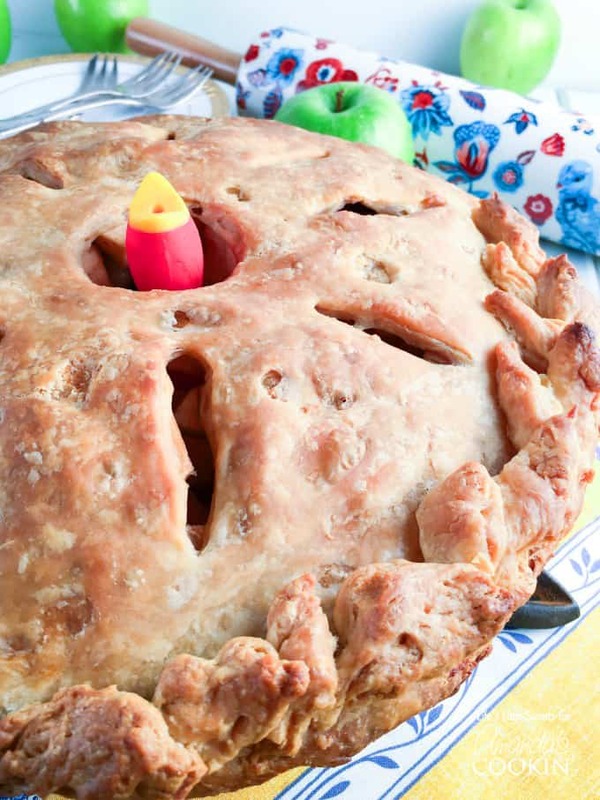 After the bottom crust has been blind baked, place pie bird in the center of the bottom crust. Using a large spoon, spoon in the apple pie filling around the pie bird, pour any excess pie filling juice over the apple slices. You can gently press down on the apple slices to remove air pockets. 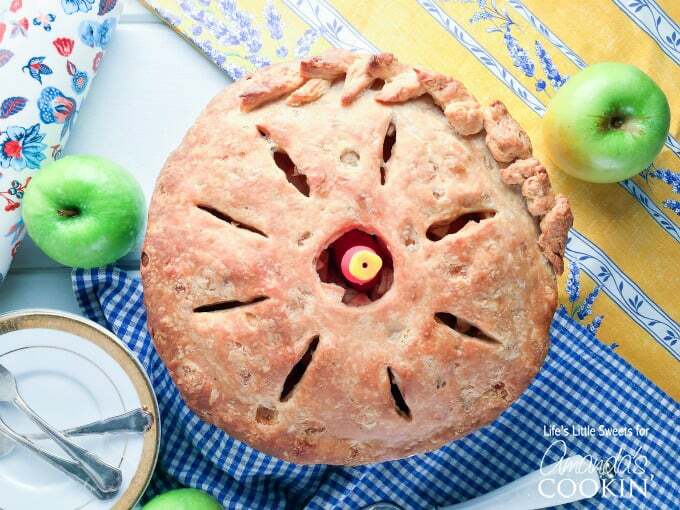 After the top crust pie dough has chilled for 30 minutes, remove from the refrigerator and cut a small circle in the center, just enough for the pie bird, you can also cut slits around the pie bird after the pie dough is carefully placed over the apple pie filling. Crimp and trim the edges. If there are trimmings you can make cut outs of your choosing. Egg wash is optional, be aware that an egg wash can make the pie look more browned as it bakes, so keep an eye on it in the oven. Bake for 1 hour. Check on it 30-45 minutes in, to make sure the top isn't getting overly browned. Put a piece of aluminum foil tent with a circle cutout for a vent to reduce browning, if need be (I usually do at 45 mins in). Bake the remaining time. Allow the pie to cool completely, this ensures it sets up before you cut into the pie.